There and Back Again: An Elf's Endeavour: CC: We Have a Runner! Tonight at Milestones I found myself working at the service bar next to the kitchen. Every minute or so the expediter in the kitchen would yell “Can we have a runner?” (to run food out to a table) which basically became the key element in my night’s soundtrack. As time went on and I got increasingly tired, I started to feel like I was back in the trenches again, waiting for my cue – “We have a runner!” – for me to pull out my rifle and run the length of the trench. It was one of my first ever experiences being an extra, and also probably the most uncomfortable. Dressed in a Canadian outfit from the First World War, I spent the majority of my days huddled for warmth with the other soldiers in our flooded trench, waiting for our brief moment of action. 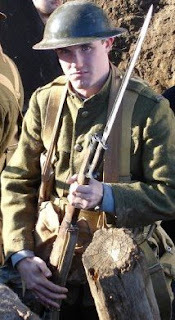 I know the actual soldiers we were portraying had to live in those conditions for ages and deal with the stench of death, but putting in a twenty hour day in a genuine uniform in a genuine replica trench was more than enough to convince me that if I ever find myself reincarnated in the 1910’s, there may be one particular historical event that I want to steer clear of. On the other hand, singing and dancing in a forest glade might be an entirely different experience when I’m an elf. Unless I’m fighting orcs in the Battle of Five Armies! You'll never see a shot this clear of me in Geoff Webster's Beyond the Line. i think we need a new blog post...vosh?